Commander in Chief needs to be returned to tv immediately. Best political drama since the West Wing. Strong brilliant female characters and a smart, timely plot. We need it NOW. ONLY recently viewed all 18 episodes of Commander and Chief. I am gutted that this show ended. It is certainly one of the best TV series that I’ve seen in a long time, this one was so much more realistic. Is there any chance this will come back? This is one of the best TV shows I have seen in a long time. I have watched the episodes on hulu several times. Is there any chance this will come back? Did they ever make a 2 hour movie? Would love to see this on the air again. Great series. Now would be a good time to bring it back. Maybe it would inspire an independent to run in 2016. I’ve watched it for the 10th time. Ever since it came out, I’ve skipped classes and left work early to watch it. Bought the DVDs and watched it 10th time. Cry everytime and wish this show could be back! It did not get killed, it was only because of American Idol. The studio did not want the ratings go down, so they postponed the show, but than it was cancelled. If it’s due to American idol, this is the last year for American Idol. Bring it now…it will be perfect!! Some shows seem boring that are drama. 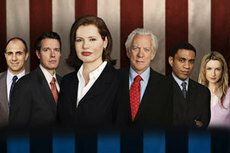 But, Commander in Chief was always so gripping, powerful, and I couldn’t wait until the next episode. I was proud of her, despised those that attacked her at every move. I’d love love love to see what it can do now! ONLY recently viewed all 18 episodes of Commander and Chief. I am so bummed that this show ended. It is certainly one of the best TV series that I have ever seen, along with early 24 Hours and NCIS……but this one was so much more realistic and, I think, also educational – concerning the real inner workings of the Washington power elite. Can it come back? Please ? Just watched the show again on Netflix. So much potential is there. Would really love for this show to make a comeback or possibly a movie. Davis is amazing. This show is awesome! Makes me proud to be a woman! Gotta bring this show back!!!! Just got done showing this to my new bride! She loved it to death and wondered why it got killed. My GB had some contact inside the network and told them to cancell it or there would be issues with labor or some such crap who knows, well just an idea! I thought this was the best drama series I had watched in a long time! WOW really shows the dirt in WDC and the meat grinder the President goes through on a daily basis. We need more shows like this.